Just published for pre-order! 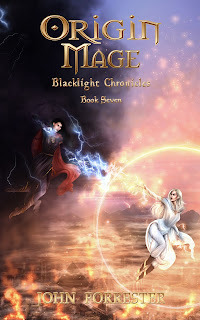 Book 7 in the Blacklight Chronicles fantasy series, Origin Mage, will be available on Amazon December 12th! "It has been a year since the Nameless was trapped in the Underworld along with her followers. Talis and Mara have rebuilt Naru with Master Goleth’s help. The elders of Naru want Mara to become their queen, but she is wary of shouldering the burden. Rikar and Princess Devonia have returned to Carvina to live there and rebuild. But there have been rumblings across the land. Tales of people going mad after worshipping at temples to Zagros. Something strange and foul is rising. Rikar has nightmares of the Nameless returning from the Underworld. It seems the Starwalkers have never given up on their quest of revenge against the Nameless. A foolish quest that will lead to their demise. It will also bring Talis, Mara, and their friends hurtling into an oblivion so dark, they might never escape." Read a free sample of Origin Mage on Amazon.